The resistor is one of the most essential electrical and electronic component that is used in various electronic devices. These are available in different sizes as well as shapes in the market based on the application. We know that, any basic electrical and electronic circuit’s works with the flow of current. Additionally, this is also categorized into two types namely conductors as well as insulators. The main function of the conductor is to allow the flow of current whereas an insulator doesn’t allow the flow of current. Whenever a high voltage is supplied through a conductor like metal, then the total voltage will supply through it. If the resistor is connected to that conductor then the flow of current, as well as the voltage, will be restricted. This article discusses an overview of the resistor. The definition of the resistor is, it is a basic two-terminal electrical and electronic component used to restrict the current flow in a circuit. The resistance toward the flow of current will result in the voltage drop. These devices may provide a permanent, adjustable resistance value. The value of resistors can be expressed in Ohms. The resistance can depend on the Ohm’s law which is discovered by the German physicist namely “Georg Simon Ohm”. For example, a carbon film resistor is taken to give details of the construction of a resistor. 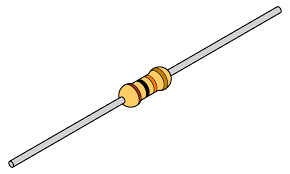 The construction of a resistor is shown in the below diagram. This resistor consists of two terminals like a normal resistor. The construction of a carbon film resistor can be done by placing the carbon layer on a substrate of a ceramic. The carbon film is a resistive material toward the flow of current in this resistor. However, it blocks some amount of current. The substrate of the ceramic performs like the insulating material toward the current. So it doesn’t let the heat through the ceramic. Thus, these resistors can resist high temperatures without any harm. The end caps on the resistor are metallic that are placed at both ends of the terminals. The two terminals are connected at the two metallic end caps on the resistor. This resistor’s resistive element is covered by epoxy intended for safety. These resistors are mostly used due to the less noise they produce compare with carbon composition resistors. The tolerance value of these resistors is low then the carbon composition resistors. The tolerance value can be defined as the dissimilarity among our preferred resistance value, as well as the genuine construction value. The resistors are accessible in the range from 1Ω to 10MΩ. 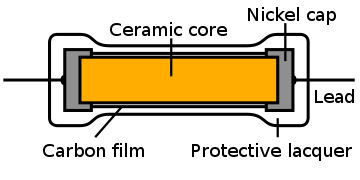 In this resistor, the preferred resistance value can be attained with either cutting the width of a carbon layer in a helical style with its length. Generally, this can be done with the help of the LASER. Once the required resistance value is attained then the cutting of metal will be stopped. In this type of resistor, when the resistance of these resistors decreases once the temperature increases, which is known as the high negative temperature coefficient. 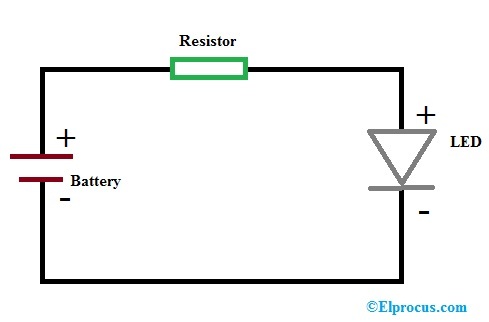 The simple resistor circuit diagram is shown below. This circuit can be designed using a resistor, a battery, and an LED. We know that the function of resistance is to restrict the flow of current throughout the component. In the following circuit, if we want to connect the LED directly with the voltage source battery, then it will damage immediately. As the LED will not allow a large amount of flow of current through it, due to this reason a resistor is employed in between the battery as well as LED for controlling the flow of current toward the LED from the battery. The resistance value mainly depends on the rating of the battery. For example, if the rating of the battery is high, then we have to use the resistor with high resistance value. 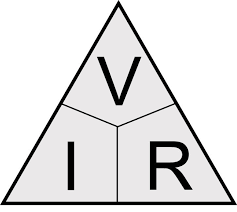 The resistance value can be measured using the formula Ohm’s Law. For example, the voltage rating of the LED is 12 volts, and the current rating is 0.1A otherwise 100mA, then calculate the resistance using Ohms Law. So, in the above circuit, a 120 Ohms of the resistor is used for avoiding the LED damage from the overvoltage of the battery. The simple way of connecting resistors in series as well as parallel in the circuit is discussed below. In a parallel circuit connection, when the resistors are connected in parallel in a circuit, then the voltage across every resistor will be same. The flow of current across the three components will be the same as the amount of current across every resistor. 1/ R Total = 1/ R1 + 1/ R2 + 1/ R3. 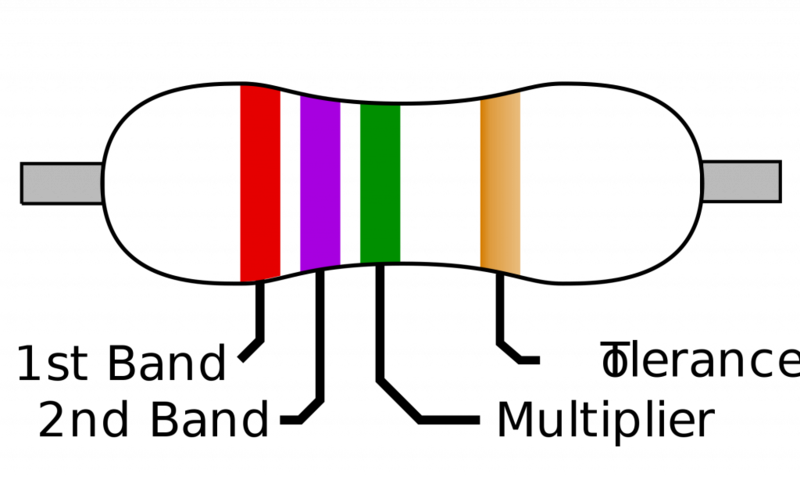 The resistance value of a resistor can be calculated using the resistor color bands. Please refer to this link to know Different Types of Resistors and Its Color Code Calculation in Electronics. The step by step procedure of calculating the resistance of a resistor using multimeter is discussed below. The second method for calculating the resistance can be done with the help of the multimeter or ohmmeter. 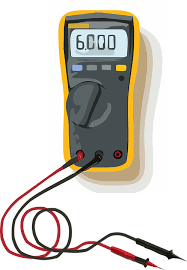 The main purpose of the multimeter device is to calculate three functions like resistance, current, and voltage. The multimeter consists of two probes such as black robe as well as a red robe. Place the black probe into the COM port, as well as place the red probe into the VΩmA on the multimeter. One can calculate the resistance of a resistor using two different probes of a multimeter. Before resistance calculation, you have to place the round disk in the direction of an ohm, which is indicated on the multimeter with the Ohm (Ω) symbol. The applications of resistor include the following. Thus, this is all about an overview of the resistor which includes what is a resistor, what is resistance, construction of a resistor, resistor circuit, resistors in series and parallel, resistance value calculation, and applications. Here is a question for you, what are the advantages of the resistor?